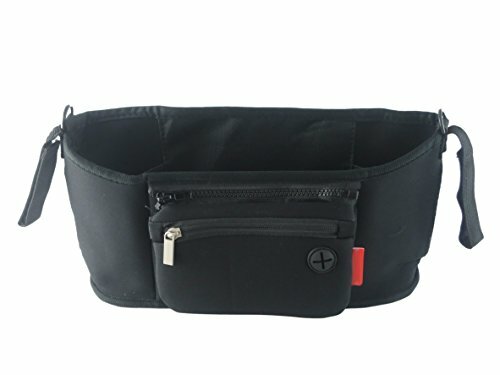 Universal Stroller Organizer with Removable Zipper Pouch Bag for Baby Buggy Pushchair Pram - Fits all Toddler or Baby Stroller - Storage Bag with Insulated Bottle & Cup-holder & Center Pocket by Groupcow at Baby Stroller Car Seat Combo. Hurry! Limited time offer. Offer valid only while supplies last. Keep Drinks Warm or Cold: With our 2 compartment insulated storage for baby milk, water bottles etc, this organizer will keep them warm or cool, perfect for when you or your baby need a well deserved drink. Easy Access Organiser: This accessory is very useful for mums, easy access to essentials like phones, wallets, or emergency items for your baby's needs.